Now that we have entered Autumn, insect activity has waned - but certainly not ceased. 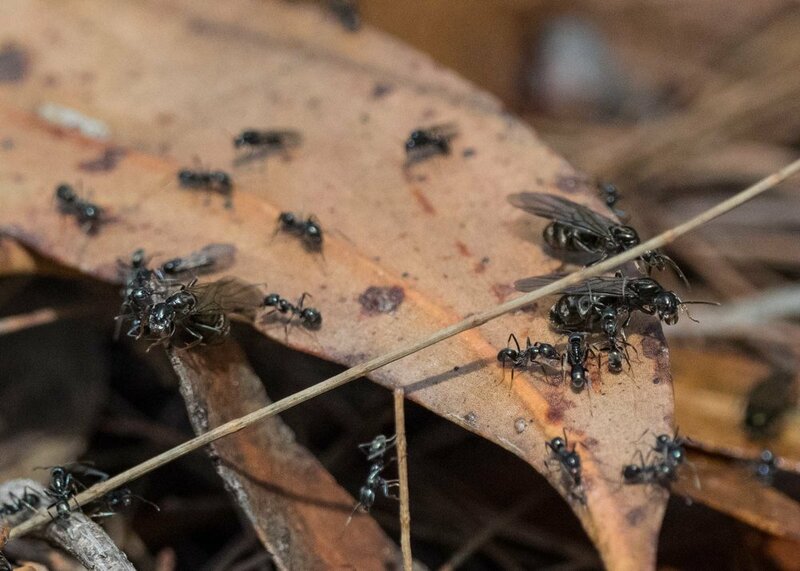 Yesterday, we noticed a large number of small black ants swarming over vegetation on the forest floor. Closer examination revealed these were Black Tyrant Ants (Iridomyrmex rufoniger), a species we know well from watching its interactions with caterpillars of the Imperial Hairstreak butterfly (Jalmenus evagoras). 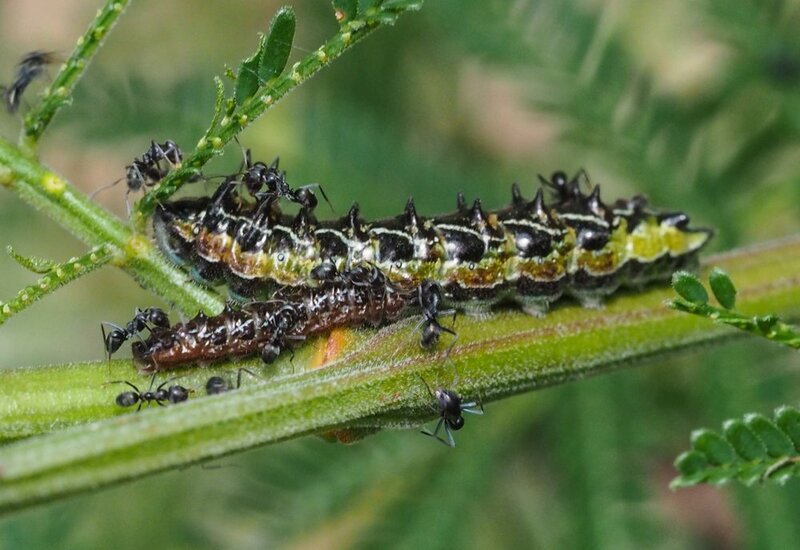 Black Tyrant Ants attending Imperial Hairstreak larvae. They take honeydew from glands on the backs of the caterpillars and in turn protect them from parasitism by wasps. A striking aspect of our sighting yesterday was that many of the ants were winged (alates). These alates were clustered at the ends of twigs or leaves, from where they would occasionally take flight. Several of the alates were much larger than the others and had swollen abdomens. These are the queens - their abdomens are packed with eggs. The smaller alates are males. 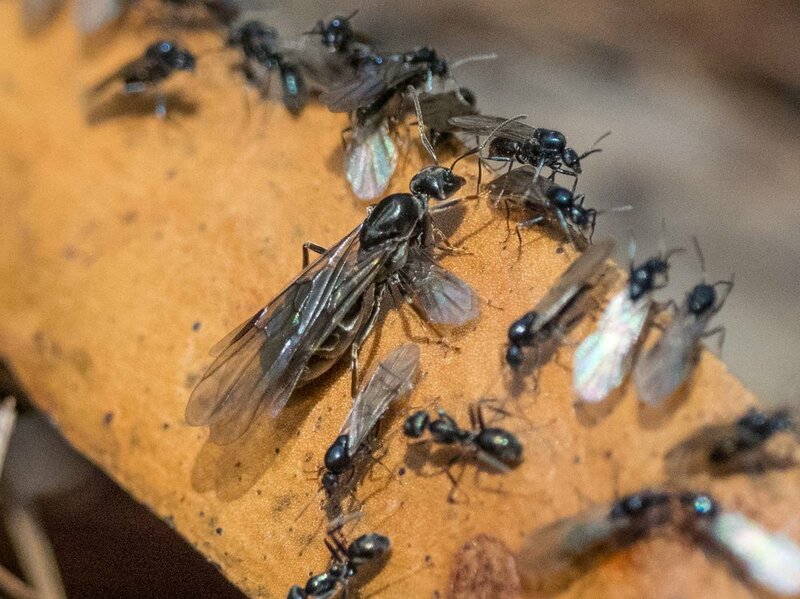 The website antwiki.org gives a nice explanation of why queens and male alates are gathering on the surface in this fashion - it is the start of a new life cycle. These alates have left a nearby nest and are about to embark upon their dispersal flight. We saw the same thing happening in this ant species at around the same time last year. What happens next varies between different groups of ants. The following description applies to most ants in the subfamily Dolichoderinae, to which Iridomyrmex rufoniger belongs. However, much remains to be learnt about the life histories of most ant species. Queens and males fly off and land on large objects, such as bushes, which serve as meeting places for ants from different colonies. Mating takes place either in the air or at the meeting place. After mating, the queen heads off in search of a suitable secluded nest site. Having served their sole purpose of reproduction, the male alates die within a few days. Sorry guys! The queen's first task is to bite off her wings, which she no longer needs. She then lays a small batch of eggs, from which the first larvae of the new colony hatch. The queen feeds those founder larvae with unfertilised eggs, which she herself produces. This avoids the need for her to make potentially dangerous forays outside the nest for food. Remember that she started this business with a large store of eggs in her fat little body. The founder larvae develop into adult worker ants and leave the colony in search of food for the next generation of larvae. From now on, the only function of the queen is to lay eggs in her brood chamber. No searching for food, no feeding babies. Not a bad life? We know the seasons have turned when termites take flight. 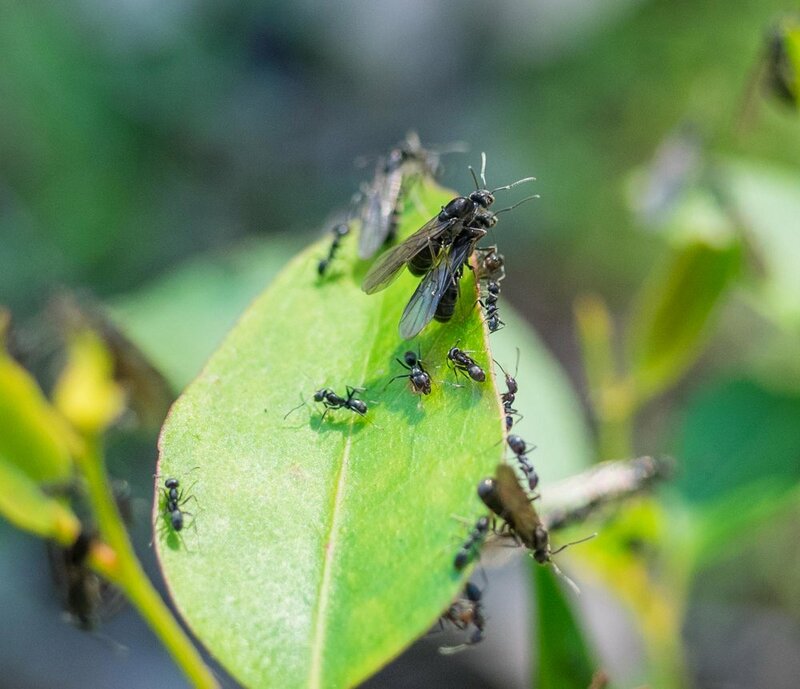 Here we take a closer look at these tiny insects: their dispersal strategy; courtship behaviour; and the general feeding bonanza they support.